PUBLIC SCHOOLS are commonly described as engines of democracy and citizenship, and a bulwark against social strife. Which makes the Democrats' bitter and unremitting campaign against Betsy DeVos all the more ironic. Protesters gathered outside a public middle school in Washington, D.C., to block Education Secretary Betsy DeVos from entering. DeVos, the next secretary of education, is a billionaire who has for years channeled her money and energy into the cause of education reform, especially for the underprivileged. Yet her nomination drove the left to a frenzy of opposition evoked by no other Cabinet nominee. The confirmation of the new secretary was a blow to the powerful teachers unions that exercise so much clout in Democratic Party circles. The unions depend for their wealth and influence on the public education monopoly that keeps millions of students trapped in chronically failing schools, and like all monopolists they have a visceral antipathy to competition. They despise DeVos because of her passion for dramatically expanding school choice — through charter schools, online "virtual" teaching, homeschooling, or vouchers to pay for private or parochial school tuition. The benefits of school choice, especially for kids in the poorest districts, have been confirmed and reconfirmed. Polls routinely find that substantial majorities of Americans favor more school choice. And as the stunning number of student names on charter school waiting lists demonstrates, the hunger for a better option than the local public school is anything but theoretical. Yet the reasons to liberate Americans from the monopoly of government-run schooling go beyond educational outcomes and academic success. School choice also promotes peace. Public schools, it is said, bring together children from differing backgrounds and imbue them with the shared values that unite our pluralist society and prevent balkanization. It's a pretty theory, but it has never been true. "Throughout American history," observes Neal McCluskey of the Cato Institute, "public schooling has produced political disputes, animosity, and sometimes even bloodshed between diverse people. Such clashes are inevitable in government-run schooling because all Americans are required to support the public schools, but only those with the most political power control them." Far from being the glue that holds our communities together, public schooling is too often the wedge that drives them apart. Americans differ profoundly on countless fundamental matters — abortion and guns, gay marriage and Darwinism, immigration and policing, Islam and foreign trade. By definition, a one-size-fits-all public school model — in which school committees decide which messages schools promote, which textbooks are used, and which programs get funded — cannot reflect the views of all parents. For those who find themselves in the minority, there is no equitable resolution. Either they resign themselves to the indoctrination of their children in ways they don't approve, or they do battle with other parents or elected officials to change the way their kids are taught, or they pull out of the government-education system altogether, opening their own schools at their own expense while still having to pay for the public schools where their priorities are rejected. 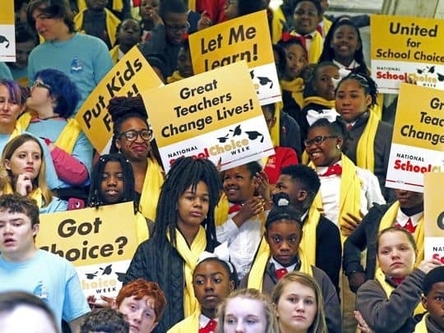 School choice supporters rallied in the Mississippi statehouse to celebrate National School Choice Week. Those attending represented public charter schools, religious schools, and homeschooling families. When public schools have a monopoly on education, coercion is inescapable. And where there is coercion, there will be conflict. At the Cato website, McCluskey maintains a "Public School Battle Map" that catalogs the clashes and angry controversies into which neighbors are constantly driven by the public school status quo. These battles erupt in state after state, year after year. They are fought over differences about curriculum, moral and religious values, reading assignments, race and ethnicity, sexuality and gender. For 2016 alone, scores of conflicts are recorded: in a Louisiana school district, for example, where students were banned from bringing American flags to football games; in Mississippi, where legislation was introduced to protect the right of teachers to discuss "controversial subjects," such as creationism; in Maine, where a high school senior's gay pride quote for his yearbook was censored; in Colorado, where atheists demanded the right to distribute antireligious literature to students. McCluskey's map, which goes back only to 2001, records more than 1,500 instances of such political fighting. When schools are controlled by the government, and the government is controlled by the winners of elections, parents, teachers, and administrators will inevitably end up doing battle. 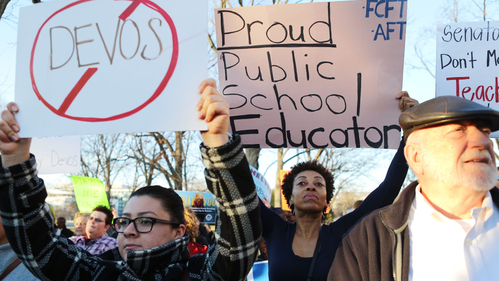 More school choice means less educational conflict. Let families choose from a wide array of educational options, and you diminish their impulse to fight over what gets taught and by whom. Winner-take-all is a terrible model for civil society. By contrast, a model built on freedom, pluralism, and equality — a model in which parents have as much leeway to provide for their children's schooling as they do for their meals, clothing, or religious training — would be immeasurably fairer, and a far better bet for keeping the peace. (Jeff Jacoby is a columnist for The Boston Globe).